Why not use an esp8266 and mqtt. No physical connection needed. Perhaps you should describe what you’re trying to do. What kind of sensors? Why do they all have to go into one Mega? I have a bunch of sensors around the house and each has a $1 esp8266-01 that publishes an MQTT message every few minutes. if i recall, the mega has 54? digital IO pins… and 16 analog inputs… how many sensors are you using !? Ill second the suggestion of using ESP8266 MCUs over MQTT, it will make your life much easier in the future. No to mention that it seems unlikely, in the absence of a lucky break on your wiring, that it is going to be really easy to wire that many sensors back to your pi. If you want to run all those cables, then fine. What you describe is one way of running a home automation system. A pi has four USB ports so you can attach 4 arduinos, more if you want to use a USB hub. But you only need one relay per lighting circuit of course. You are also going to need to be very careful about mains/low voltage isolation. Take a look at the Shelley products which allow an independent old fashioned light switch as well as home automation control. I don’t know if this is the best solution but my focus is to have my home wired as much as possible (to avoid internet connection problems like wifi / internet provider errors) + to have standard lightning system also (in case something goes wrong like eg. system / hardware crash). Luckily I have 2 months to think about it because I will wire my new home in autumn / winter time. Shelly 1 is a good option also I’ve dscovered it a week ago and I will read about it a little bit more (maybe this will be a better idea than FTP cable for lightning. This way I can have less FTP cables and - less Arduinos, maybe one will work). Today I will try to connect Arduino Mega and Arduino Yun and give you feedback how this works. Another thing to consider is voltage drop over the distance. Depending on how large your house is or how you run your cables you might not end up with enough voltage at the wire to switch anything. But flashed with the Sonoff-Tasmota firmware that way you are not reliant on the internet and you can still use them as normal wall switches. Have you ever made up patch leads before? Using normal Cat5e/6 is a big enough pain in the arse, anything shielded is a pig to work with especially S/FTP if you don’t get the shielding terminated in the connectors correctly there is no point in using shield wire at all. 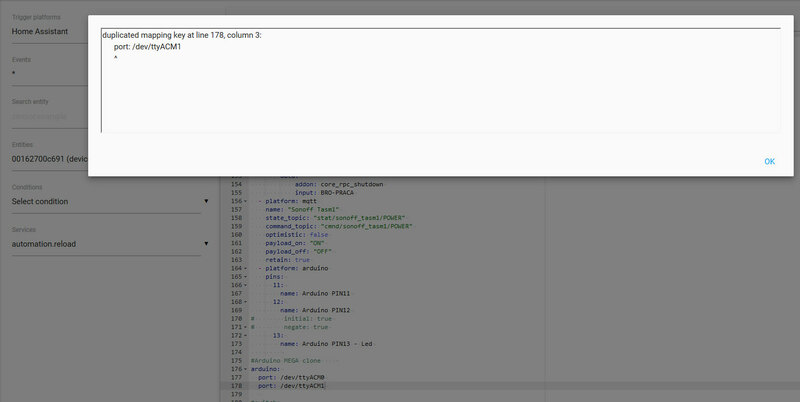 Maybe I am able to copy arduino.py file and hard coded Home Assistant core (add arduino2.py and use this in configuration.yaml) but after update I will have crash or other kind of problems. Is there a way to add more arduinos in configuration.yaml? How are you configuring them? Why don’t you use I2C IO expanders? which is mentioned in the docs? Also have you confirmed the second one is ttyACM1? Try deleting ttyACM0 from your config, can you then see ttACM1 ok? Before spending too much money on Arduino or cabling parts I would start off simple and make a test rig. I would still recomend having a look into the Sonoff-Tasmota firmware all you need to install is Mosquitto and setup WiFi and it is pretty much set and forget after that. and works (Led blinks in Port 13 after switching on). That means that my first and second Arduinos are connected ok. When I conncect using Putty (“dmesg” command) i see ATM0 and ATM1 so there is no connection error. For sonoff Tasmota - I have one configured myself couple of days ago and it work flawless using MQTT. 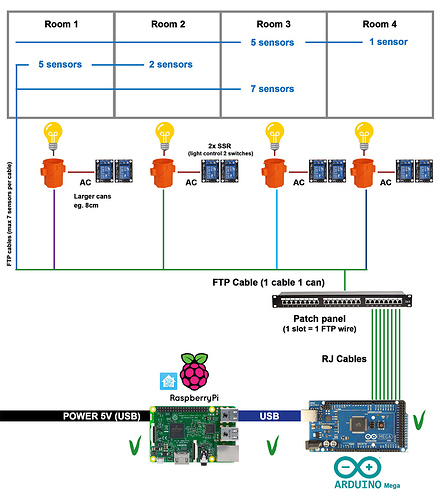 This is a good method, but I still would like to have everything wired and controlled by Rpi / Arduinos because this way I can avoid problems like password change issue / sonoff crash / wifi signal problems / new software update errors / security issues. When I use method with FTP’s I don’t need to deal with so much problems that can occurs during some years of using HA, plus maintain standard installation up and running even when something bad happen. I appreciate your wish to avoid wifi and envy your ability to wire your home from scatch. Another approach perhaps: set up each arduino with an ethernet shield and get it communicate with home assistant via mqtt. Thanks nickrout, I don’t have experience with shields but I think it will be not so easy to control Pin inside Shield using Home Assistant (MQTT will work but setup will be hard). I will try to create some custom components like arduino2.py today. Maybe this helps. I also created a topic in future requests (More than one Arduino board). I’ve created custom component and works great. The files are placed in GIT repo. If someone want to connect more than one Arduino my custom components will work Arduino Boards extension. Tomorrow I will provide some images how this works.